Mid bloomer. Flat topped clusters of flowers, soft, fern-like leaves. Used for medicinal teas, tonics, poultices. Notes: Member of the Aster (Sunflower) Family, Mayweed Tribe, related to the Pineapple Weed. Found in grassy areas. Achillea is after the legendary Greek hero, Achilles, who presumably used yarrow to cure some of his soldiers’ wounds. (Achilles reportedly said that if you put yarrow juice in your eye, it takes away redness). Millefolium means thousand leaved referring to the lovely much-divided leaves. 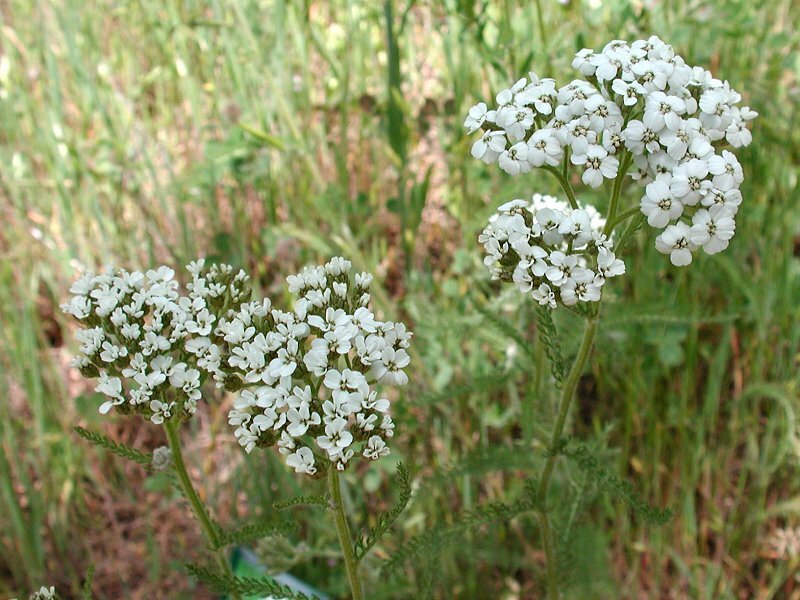 As with other Mayweeds, Yarrow is strongly aromatic -- some Mayweeds have unpleasant odors. It is used as an anti-inflammatory and has astringent properties, reduces fever. The Maidu used crushed leaves for a general tonic or for sores and as a blood coagulant (ground yarrow tops steeped in hot water). Powdered dry yarrow taken in Plantain water halts internal bleeding. It is also used for liver ailments, as a sedative, for cuts, bruises and bleeding. A poultice from dried leaves was used for rashes, and dried leaves as a medicinal tea for indigestion and hair loss. Fresh leaves were used as an insect repellent when rubbed on the skin, but can cause dermatitis in sensitive people. It is still used as a healing herb and can be purchased in health food stores. Formerly known as A. lanulosum.